The ASP.NET MVC 3 Framework is the latest evolution of Microsoft’s ASP.NET web platform. It provides a radically new high-productivity programming model that promotes cleaner code architecture, test-driven development, and powerful extensibility, combined with all the benefits of ASP.NET 4. In this, the third edition, the core model-view-controller (MVC) architectural concepts are not simply explained or discussed in isolation, but are demonstrated in action. You’ll work through an extended tutorial to create a working e-commerce web application that combines ASP.NET MVC with the latest C# language features and unit-testing best practices. By gaining this invaluable, practical experience, you’ll discover MVC’s strengths and weaknesses for yourself—and put your best-learned theory into practice. 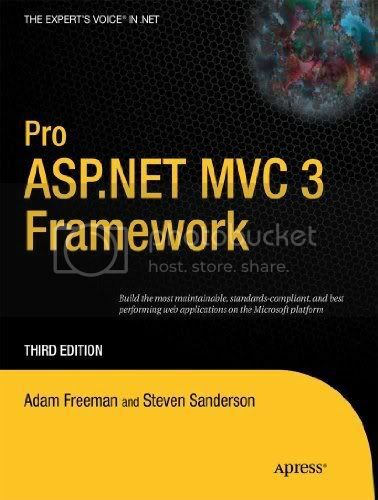 The book’s authors, Steve Sanderson and Adam Freeman, have both watched the growth of ASP.NET MVC since its first release. Steve is a well known blogger on the MVC Framework and a member of the Microsoft Web Platform and Tools team. Adam started designing and building web applications 15 years ago and has been responsible for some of the world’s largest and most ambitious projects. You can be sure you are in safe hands.